Embroidered sweatshirts offer the ultimate cool weather uniform solution. Display your logo in your company colours, on a versatile, warm and cozy sweatshirt! Call us today on 01773-550614. 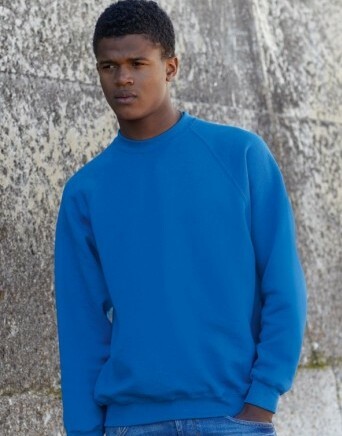 Royale Leisurewear supply all the main brands of Sweatshirt, available in a wide range of styles, sizes and colours. Embroider your company insignia proudly on your uniform to increase brand awareness staff will look smart and presentable. Embroidered sweatshirts are a highly practical garment for any business or team, available in adult and children’s sizes. Royale Leisurewear supply sweatshirts in an extensive choice of colours, including Hi-viz sweatshirts complete with reflective stripes. Royale Leisurewear can find a style to suit you and your budget, so call us today for more information on 01773-550614 or fill in the online form. Sizes for Royale Leisurewear’s high quality but affordable embroidered sweatshirts. Children’s sweatshirts – Sizes available: age 1-2 years, age 2-3 years, 3-4 years, 4-5 years, 5-6 years, 6-7 years, 7-8 years, 8-9 years, 9-10 years, 11-12 years, 12-13 years and 14-15 years. Adults sweatshirts – Sizes available: XS, S, M, L, XL, 2XL, 3XL, 4XL and 5XL. Choice of styles may be limited for larger sizes, please ask about our sweatshirts and our experienced staff will be happy to help.